The end of a long ride for Debbie Currie of Wyebridge and Glenda Edwards of Vasey who rode in the Orangeman’s Parade in Midland, Thursday. 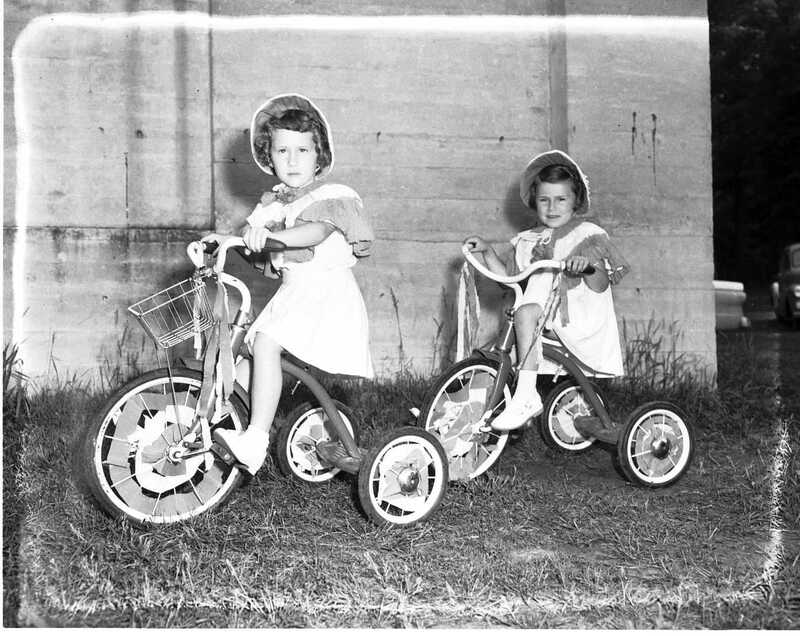 They are both five years old and their mothers belong to the Waverly LOBA (Ladies Orange Benevolent Association). 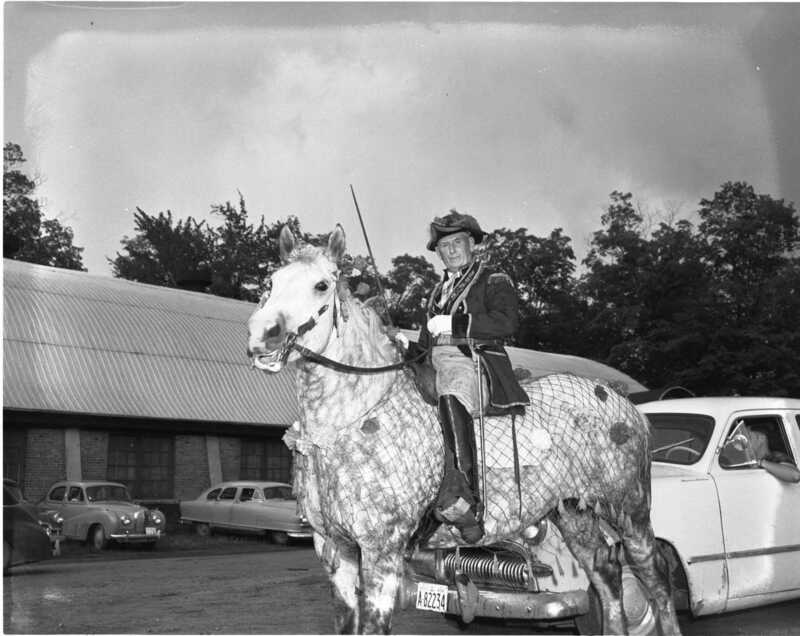 Portraying “King Billy” upon his spirited charger is Cecil Wood of Waverly, county Marshall of the East Simcoe Orange Lodge. 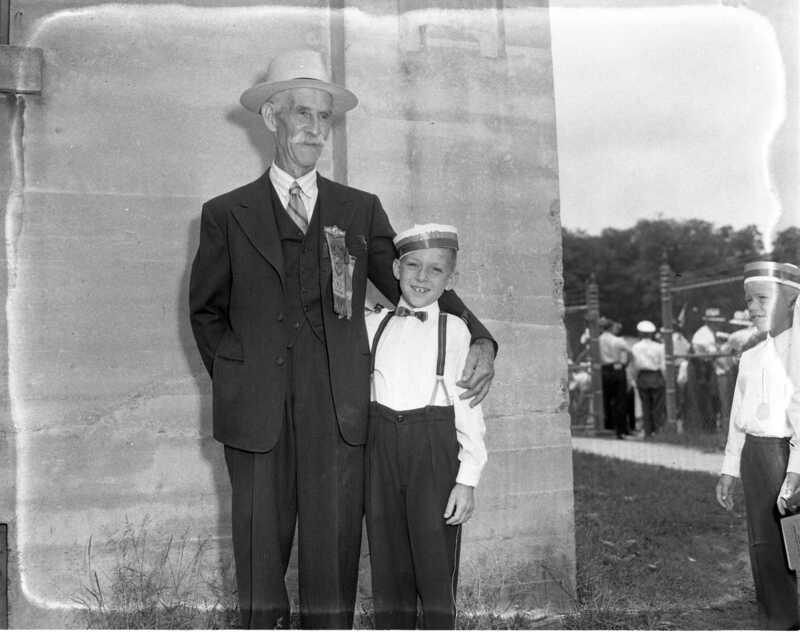 Mr. Wood led the July 12th parade in Midland and has been with the lodge for forty years. Seven and seventy-seven. Age doesn’t matter when it comes to a parade, everyone turns out. Herman Trew, 77, of Waverly LOL 589, or seven-year olds like William L. Black of the Midland lodge juveniles. 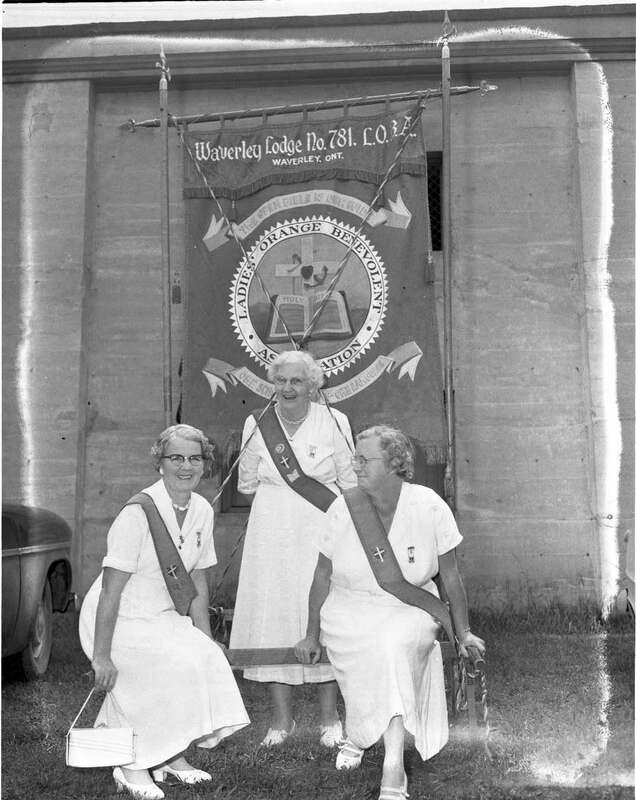 Pictured with their banner, previous to the July 12th Orangemen’s parade in Midland, are these laughing members of Waverly LOBA 781, all past mistresses of the lodge, Mrs. John Miller, Mrs. Herman Trew and Mrs. Wallace Wood. Parade on King Street, band being led by majorettes in conjunction with the Canadian Bandmasters Association convention being held in Midland. 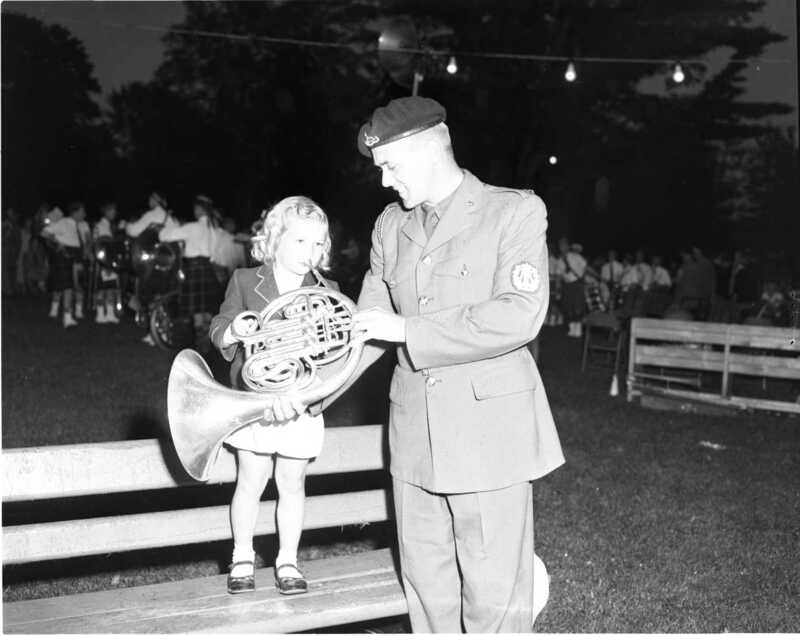 Looking quite confident that she can master the French Horn with one lesson from Sgt. F. Reidstra of the Royal Canadian Dragoons band is Debra Waiman, daughter of Mr. & Mrs. Ronald Wainman of 380 (now 496) King Street. Debra went to Little Lake Park Saturday to hear a band concert arranged in conjunction with the Canadian Bandmasters Association’s convention. 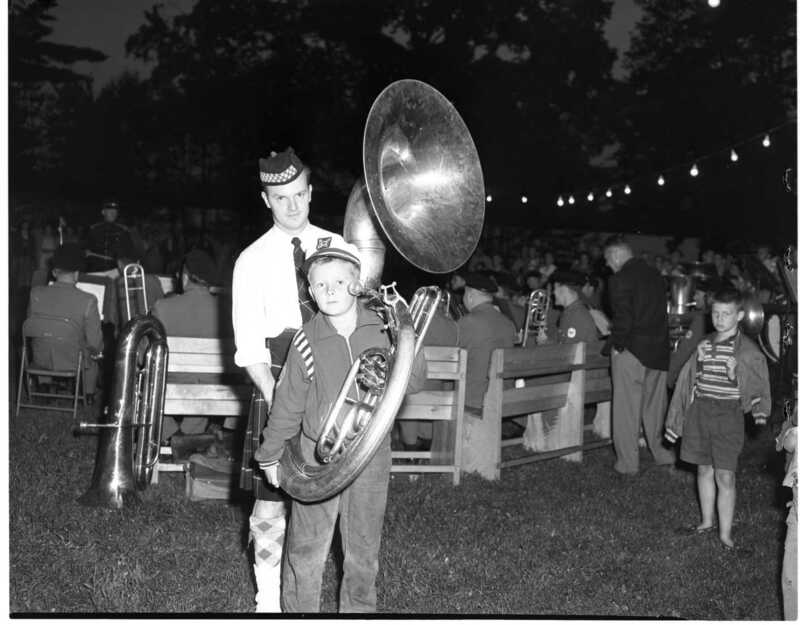 Allan Rees, 9, of Brantford, doesn’t think he will take up the tuba right away. He is helped by Al Reid who plays for the Orillia Kiltie Band and is here for the concert in the park in connection to the Canadian Bandmasters Association convention being held at the Parkside Inn. 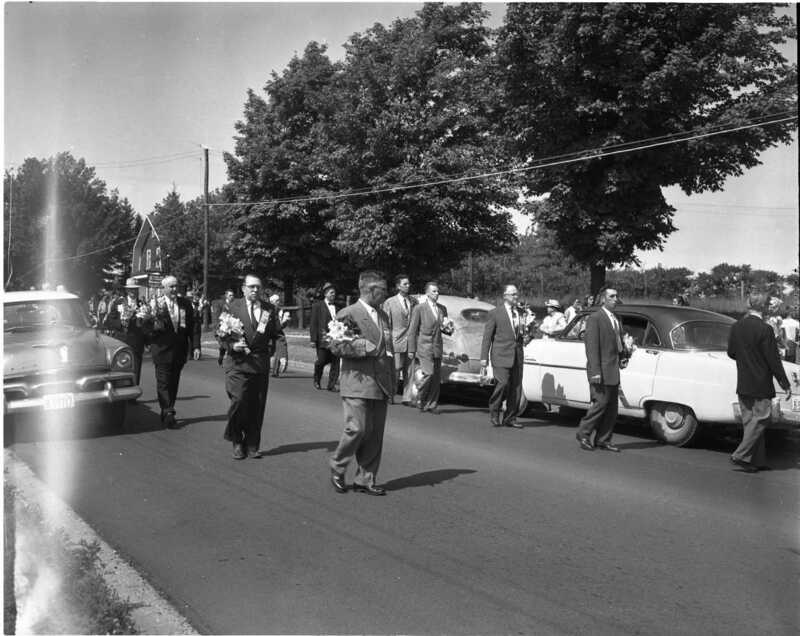 Carrying flowers for the decoration of graves of departed members, representatives of the Oddfellows, Rebekah, Orange Lodges, LOBA and the Canadian Legion march to Lakeview Cemetery for the united memorial and decoration service. Photo related to the one above but not used in the newspaper, no description. Freak twister on Sunday, July 8th, wrecked this 30 by 90 foot frame building on the Green farm in Tiny Township, uprooted trees in the nearby orchard, whirled over the top of Thunder Bay Beach and finally blew itself out over Georgian Bay. Members of the summer school of archaeology working at the Forget Site were lunch guests of Mr. & Mrs. Fred Cook at the Grange in Wyebridge on July 4th. 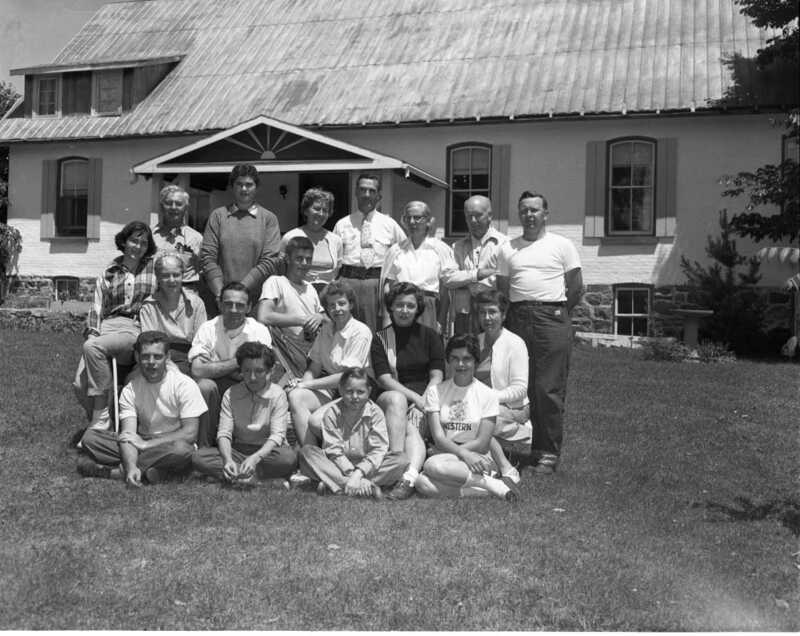 Front row; Leonard Laurin, Penetang; Thelma Sovey, Midland; Ross Channen, Barrie; Bea Ivey, Port Dover; second row, Elizabeth Cook, Wyebridge; Miss Josephine Phelan, Toronto; D. A. MacKenzie, Woodbridge; David Darker, a student at Upper Canada College Toronto; Eleanor Thompson, Cobourg; Lois Jackson, Sarnia; Miss Elizabeth Loosely, Oakville; back row, Wilfred Jury University of Western Ontario archaeologist; Cindy Reid, Toronto; Mrs. Fred Cook, Mr. Cook, Wyebridge; Mrs. Jury; F. C. Jennings and Harry Williams, London. 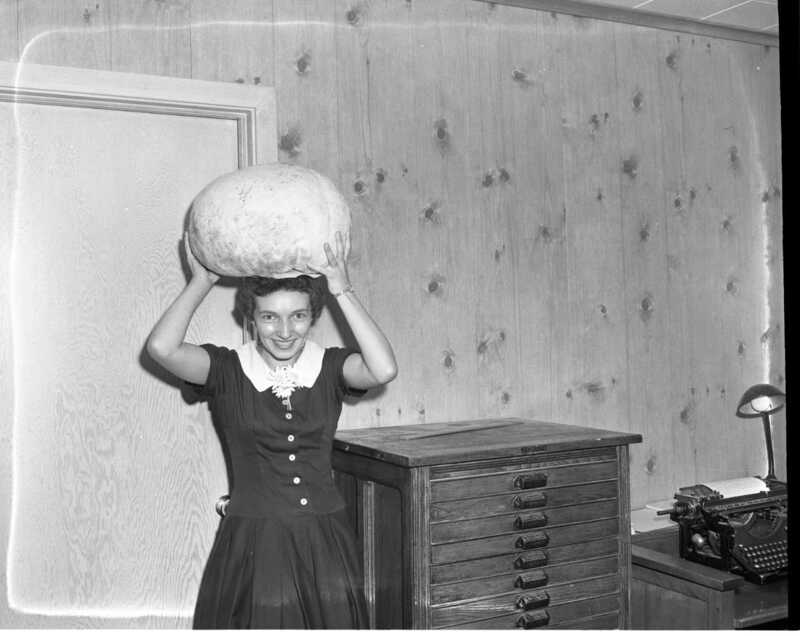 Free Press staff member Barbara Allsopp dons a giant puff-ball as a hat. Fifty inches in circumference it was found at the rear of A. W. Bath’s plumbing shop by Eddie Doyle of Dominion Ave. He found a second one that measured 46 inches in circumference. 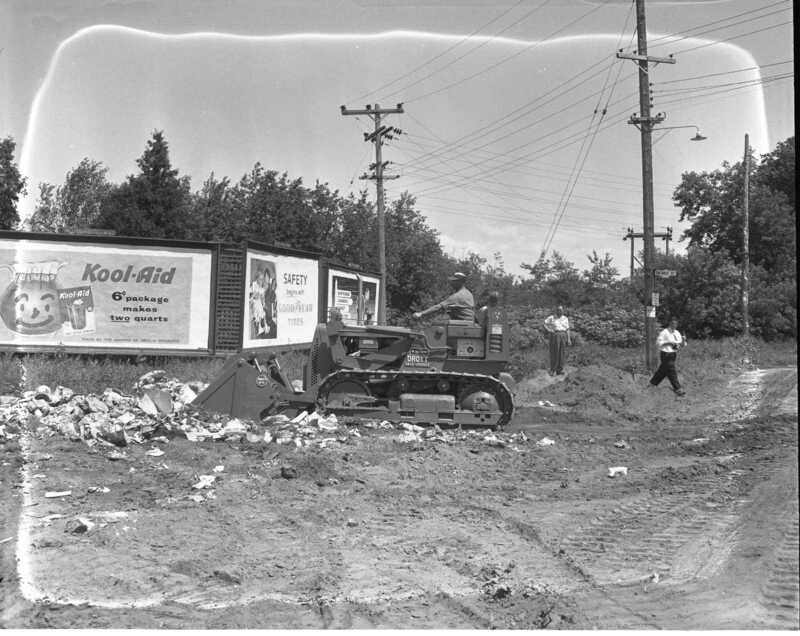 Demonstration of the sanitary land fill method of garbage disposal on a vacant Vindin Street lot, Midland. Process was being demonstrated by W. L. Ballentine Company Ltd. with a specially fitted bulldozer designed for the job. System is being used in many towns including Orillia. 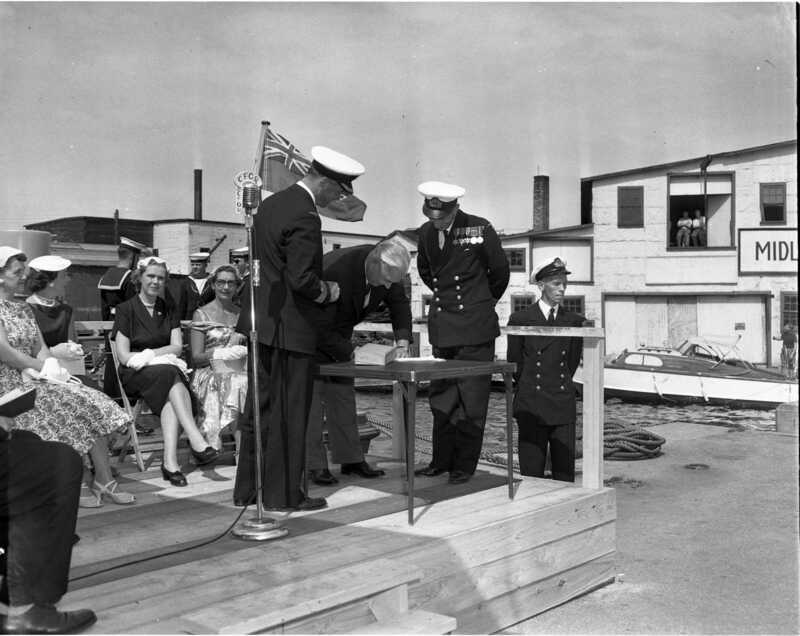 Midland Boat Works president T. M. McCullough signs the navy acceptance form during commissioning ceremonies for the HMCS Cormorant at Midland town dock Monday. The ship’s sponsor Mrs. Murray Wagg can be seen to the left of the microphone stand. Commander Henning, representing naval headquarters, and Lt. Cmd. C. R. Manfield, commanding officer, watch the signing. At right is S/Lt. Don C. Young. 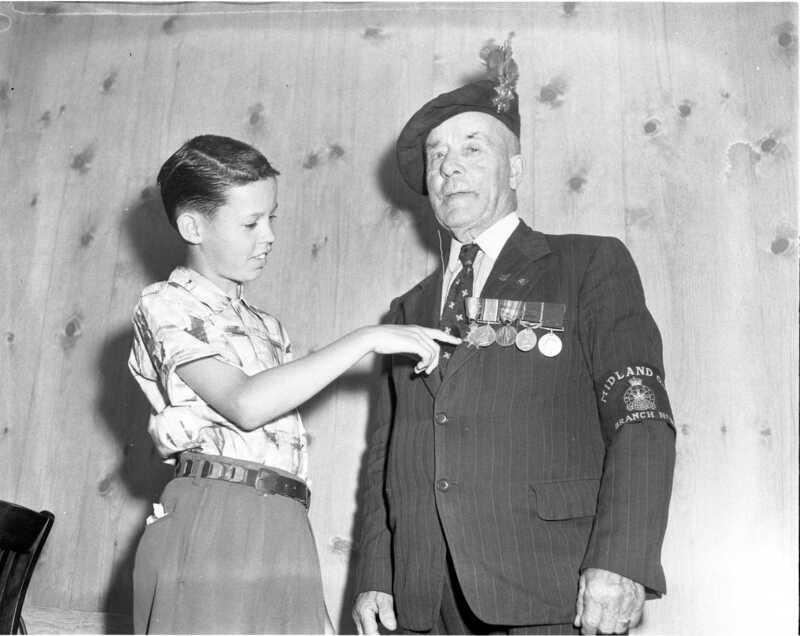 Old soldier, George Finley Walmsley, 85, of Port McNicoll shows his World War 1 medals to his 10-year-old grandson Bobby Duncan. At the Downer family reunion in Tiny Township on July 21st, Rev. 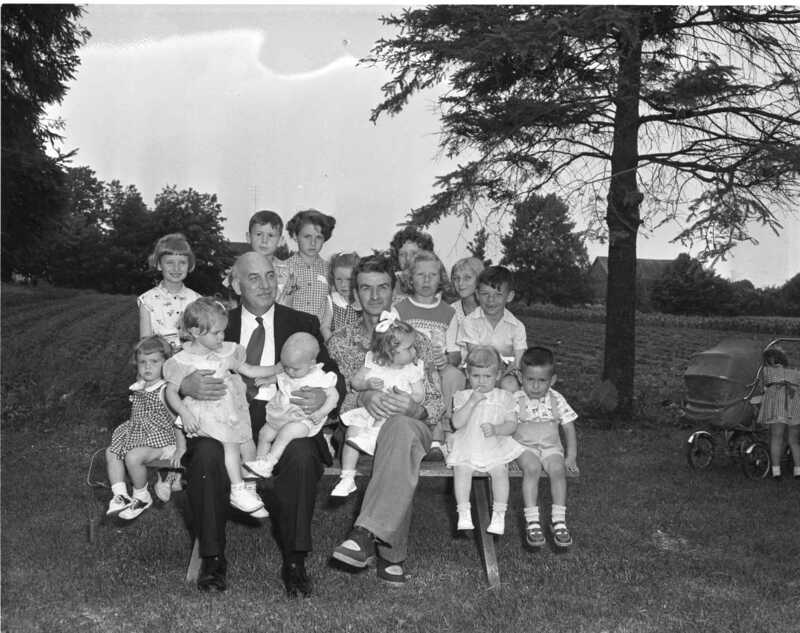 A. W. Downer of Duntroon, MLA for Dufferin – Simcoe is surrounded by children. Midland alderman Ossie Downer is also in the picture and is host of the event this year at his home on “The Mountain” west of Midland. 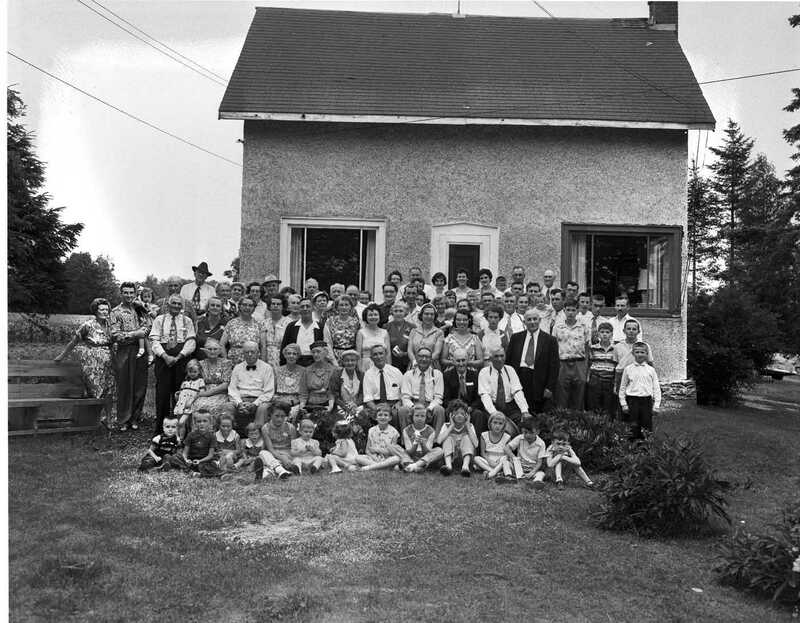 All are descendants of two brothers, William and Henry Downer, who came to Canada from County Cavan, Ireland in 1842. The original Downer’s settled near Peterborough but most of Henry’s descendants were born in Tiny Twp. Mrs. Ed Jeffery Sr. presents the trophy to the ladies champ at the Midland Golf & Country Club. 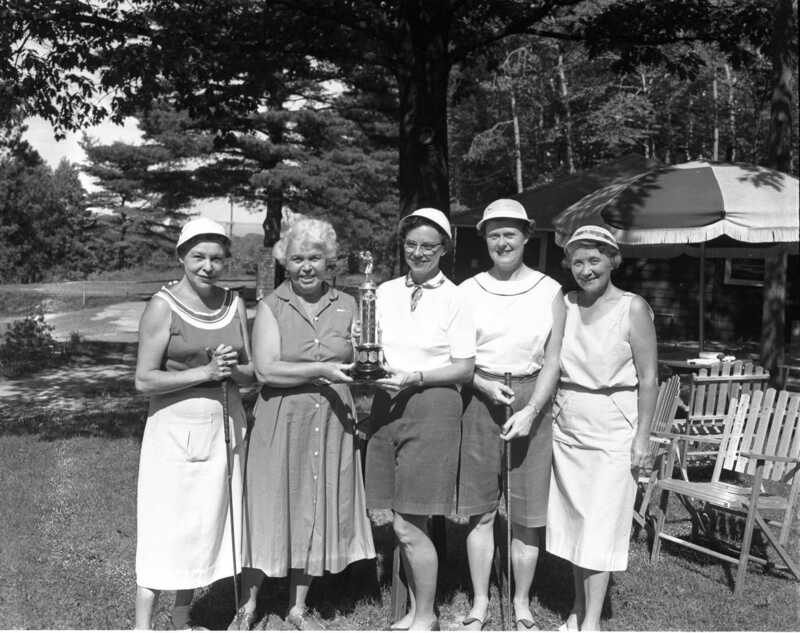 L to R; Mrs. H. L. Wilson, Mrs. Jeffery, Mrs. Cecil English, winner of the event and also last year’s club champion; Miss Jean Wallace and Mrs. A. J. Preston. 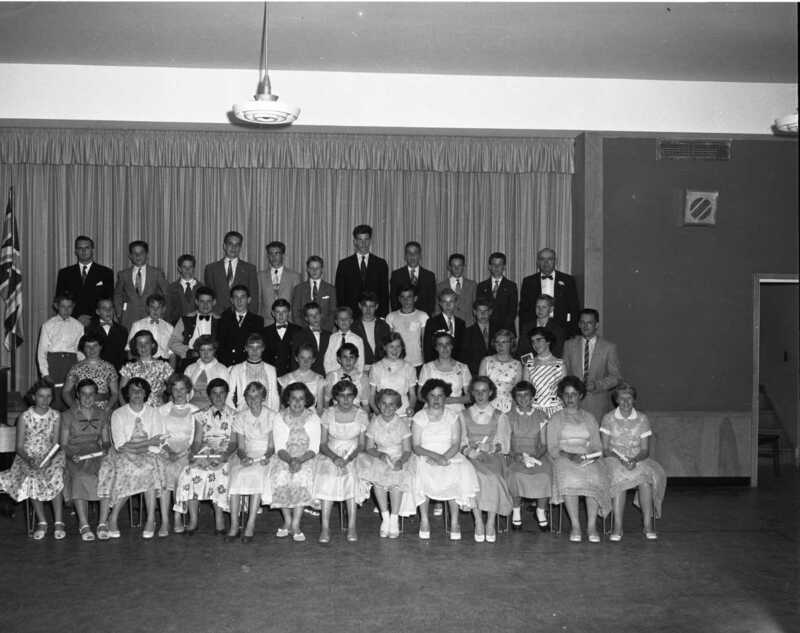 Parkview Public School, graduating class of 1956. Note that this photo was taken in the multipurpose room at Regent School, I wonder why, construction perhaps at the newly acquired Parkview School? 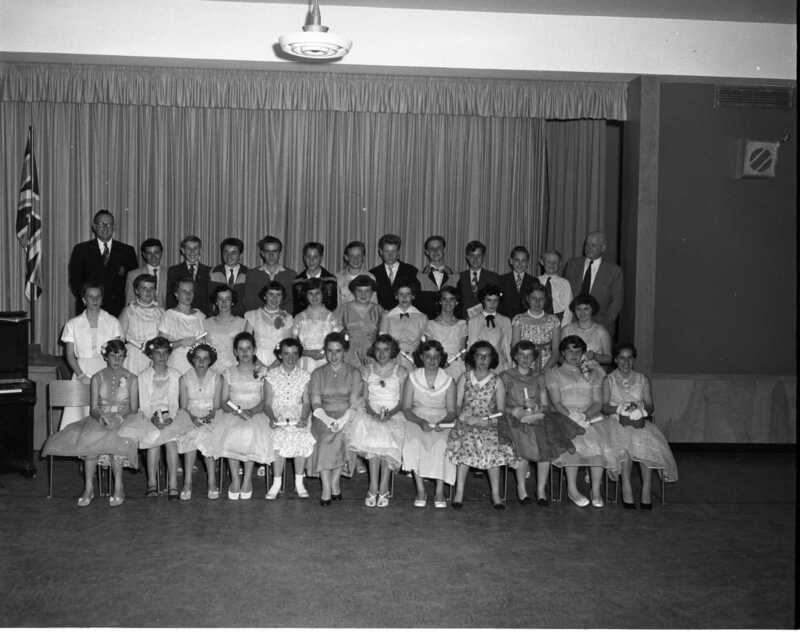 Regent Public School graduating class of 1956. I have to point out my sister, Ellen Barber, third from the left, front row. I recognize several others. 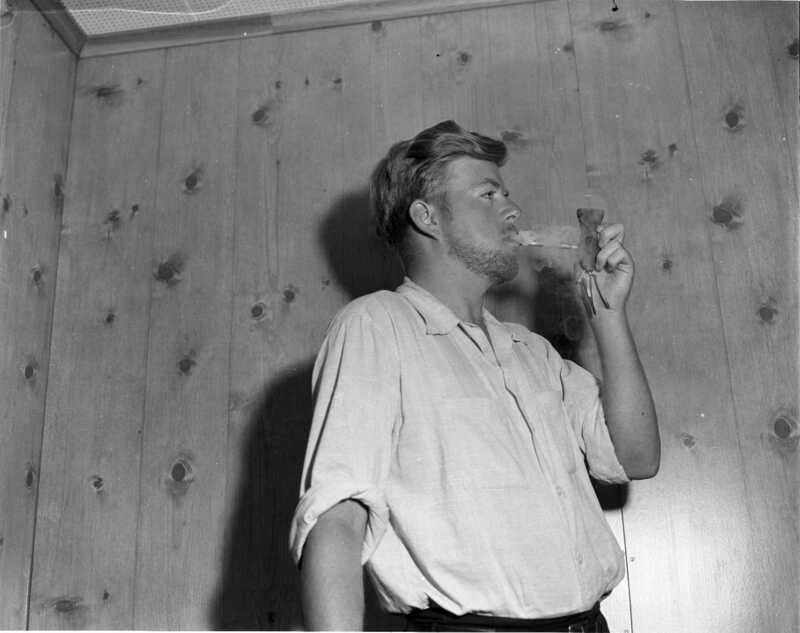 Amateur archaeologist Gordon Baker of Hamilton puffs on an Indian pipe he found near the Maxwell farm at Port McNicoll. The large soapstone bowl was fitted with a reed stem, three budgie feathers and some modern tobacco. Mr. Baker’s best finds were a pair of French iron scissors and a copper arrow-head. The same paper writes that drivers delayed by bulldozers doing roadwork near the Dutton farm (OSPCA) were unearthing native artifacts that they were collecting as they waited. From the previous paper, Mr. Tushingham, the Huronia Museum curator, informed the paper that Beamish Construction had inadvertently dug up what he believes was a native ossuary on the nearby Maxwell Farm. These ladies have solved the problem of beating the heat by moving their lawn chairs into the water at Little Lake Park Wednesday afternoon. 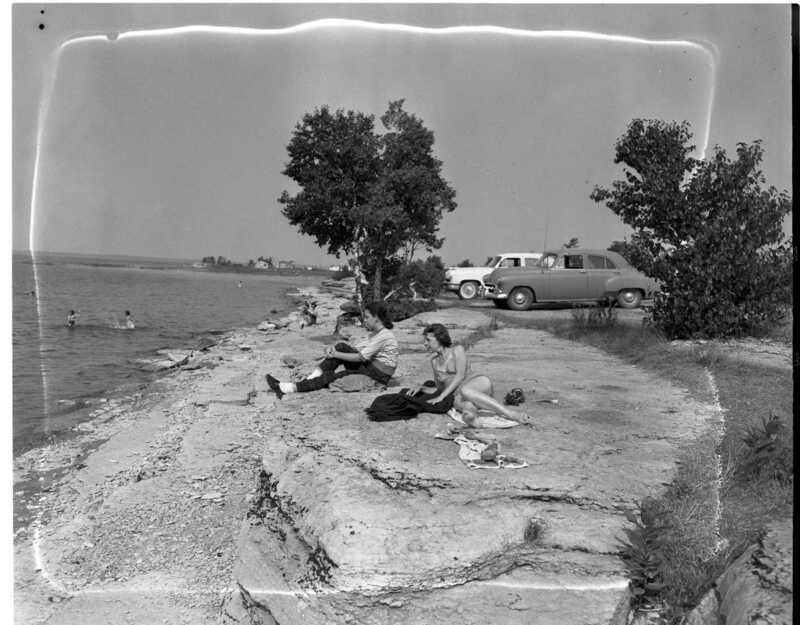 Within a few short years, Port McNicoll’s Paradise Point has become one of North Simcoe’s major beaches. Once known as Flat Point due to the flat limestone formations, the area had few cottages but a boom began when village council sold many acres to a Toronto developer. 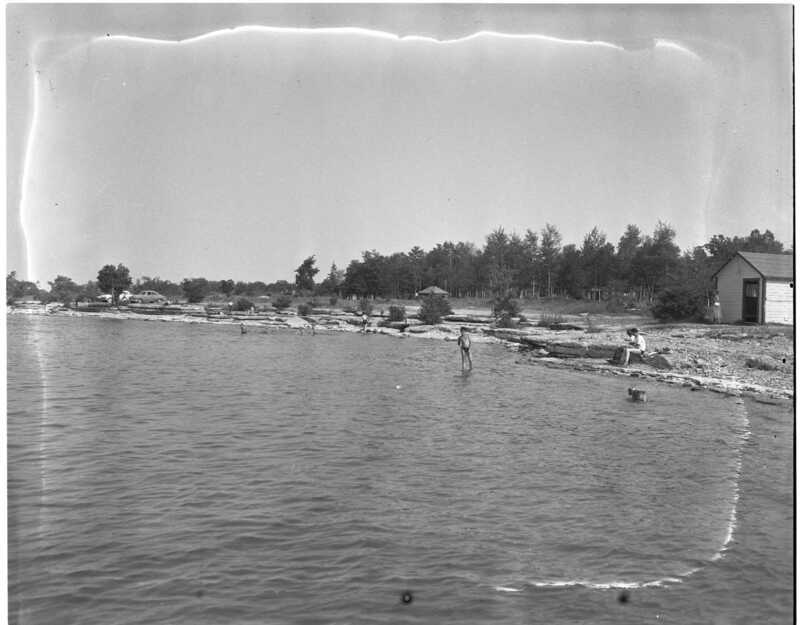 Rugged shoreline of flat limestone rocks is preferred by many cottagers and visitors who come to Port McNicoll’s Paradise Point. The rock extends only a few feet into the water before giving way to a fine sand bottom. Enjoying the sun are Mrs. W. A. McLeod, Toronto, in the foreground, and Judy Parliament of Port McNicoll. 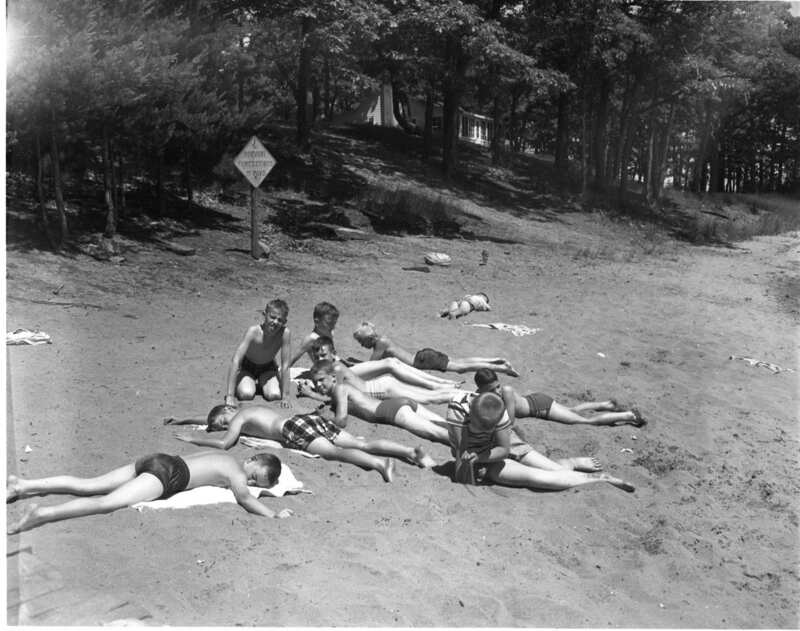 After a long swim these young campers at YMCA Camp Kitchikewana on Beausoliel Island enjoy some “Loafing’ In The Sun” time. 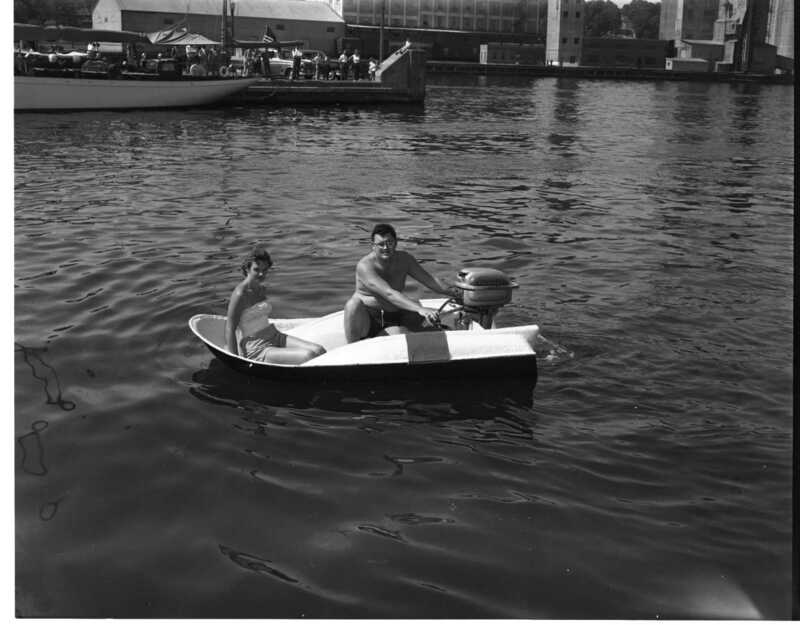 “Flyin Flivver” manufactured by Midland Reinforced Plastics Ltd. of Ellen Street is demonstrated in Midland Harbour by company official Bob Yates, accompanied by Karen Gracie of Toronto. 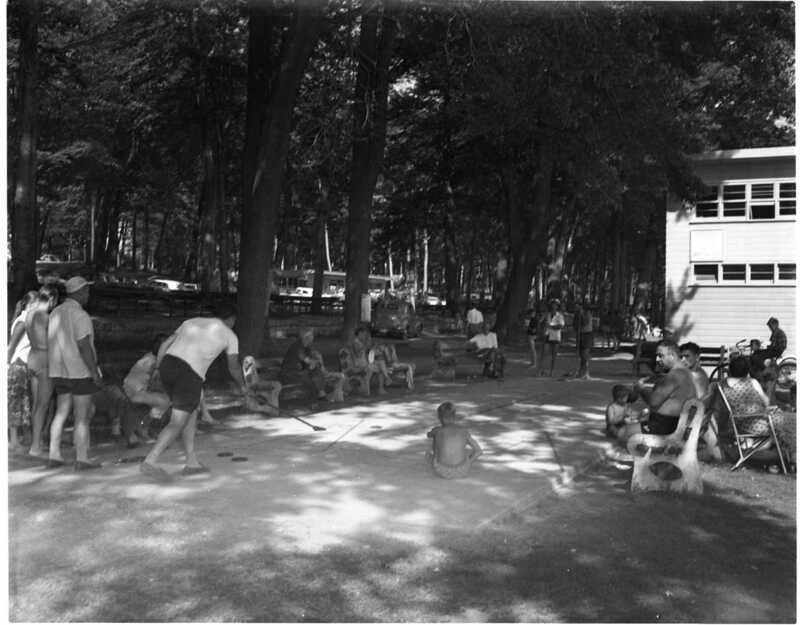 Shuffle board court at Little Lake Park provides some shaded activity for players and spectators. Midland Parks Commission bans motors of 5 HP or more on Little Lake to protect swimmers. Midland Press Limited owner of the Midland Free Press and County Herald newspapers and associated printing and publishing business will now be known as Midland Printers Limited. 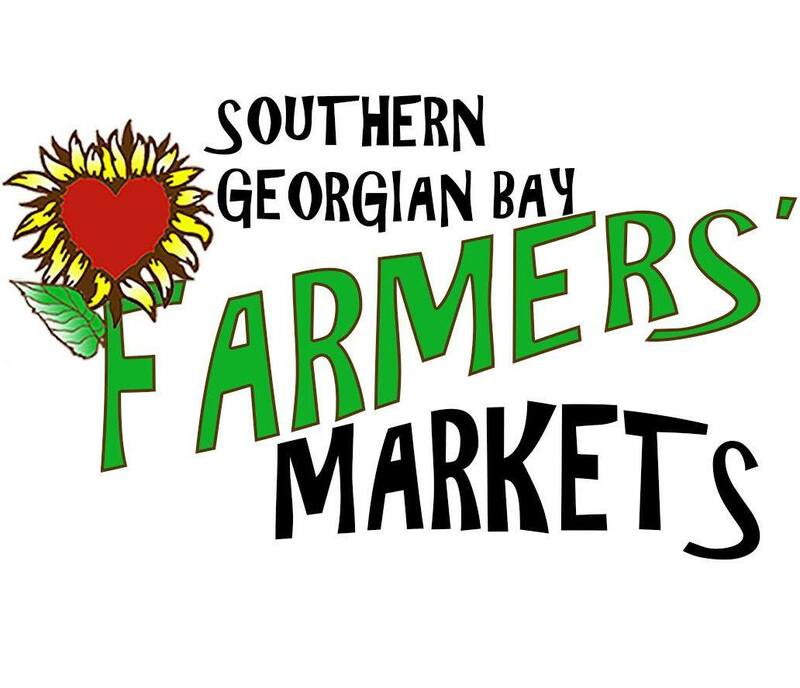 The restructuring involves no changes to employees or operations except the addition of J. Robert Chittick as vice-president in charge of sales and the promotion of James Lennox to vice president in charge of production. James Alan, minister of highways, announces an increase in speed on the 400 highway from 50 to 55 miles per hour for non commercial vehicles only. Value of Midland building permits doubles in the first six months of 1956, $221,100 compared to $101,075 in 1955. 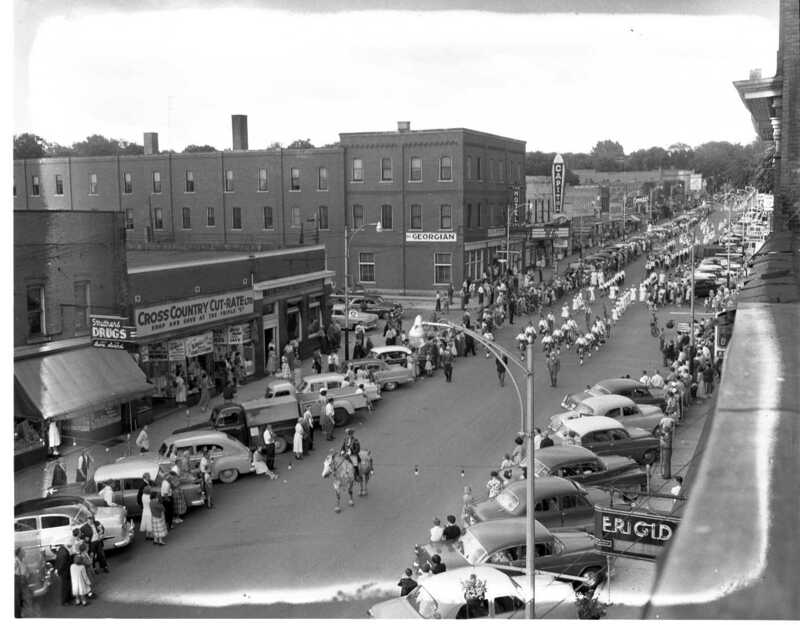 But that is well below the first six months of 1954 when permits totalled $690,800 and ended the year at 1,334,725.00. Mayor Charles Parker has moved his 18 hole miniature golf course, which until now had been located on the corner of Yonge and Eighth Streets, to the basement of his Parkside Pavilion. Midland Parks Commission requested that park booth concessionaire John Deakos obtain a paper cup soft drink dispenser. The request was made in view of the number of swimmers who are suffering cut feet on broken soft drink bottles. Members mark the 120th anniversary of the historic St. James on the Lines Church. Only modernization allowed has been the installation of electric lights. A faithful reproduction of the church was built by patients at the Ontario Hospital and is on display in the church. Former Midlander Robert (Bert) Holt has let a contract to Midland construction firm Webster Smallwood for a 6,000 square foot plant on the south side of Centre Street (Bay East of William). The new plant will house Mr. Holt’s Pinecrest Products furniture company that has been operating in Toronto for the past seven years and will employ 20 staff. One of the largest institutions of its kind in the Georgian Bay area, the Iron City Fishing Club, this week marks its 75th anniversary. The club is located in the Sans Souci area and a majority of the club members hail from Pittsburgh PA. Every summer for many years a big express car would arrive at Midland’s CNR dock siding from which personal effects of the members would be loaded onto the “City of Dover” or “Midland City” for transport by water to San Souci. Midland’s telephone exchange conversion to a direct dial system also changes the way our public pay phones work. Previously a caller didn’t put their nickel in until the operator made the connection. Now you put in your nickel to acquire a dial tone and the ingenious device returns it to you if the line is not answered or is busy. “Notice” Ken Puddicombe has purchased the M.S. Waterbus and business. At the Pen Theatre, “Rebel Without a Cause” James Dean. House for sale – Nine room brick home partially furnished, $3,500.00, early possession. Superintendent of Midland’s Aberdeen Elevator, Murray Lattimore, received severe electrical burns while working in the plants sub-station Monday morning. Dr. I. T. Weldon said Mr. Lattimore received first, second and third degree burns to his face, neck, right arm and hand. Guy and Bill Hebner advertising chartered boat trips for all occasions and fishing charters. Beatty Brothers (Spencer Division) Penetang was planning an expansion. Two new buildings were built and more than 50 new employees were to be hired. Victoria Harbour’s newest citizen was Thorbjorn Pettersen of Drammen, Norway, who operates a taxi and service station. A skilful ski jumper, Mr. Pettersen had hopes of organizing a district ski club and training local jumpers. Melville Wilkie, inmate at the Ontario Hospital, Penetang, made his first of several breakouts. 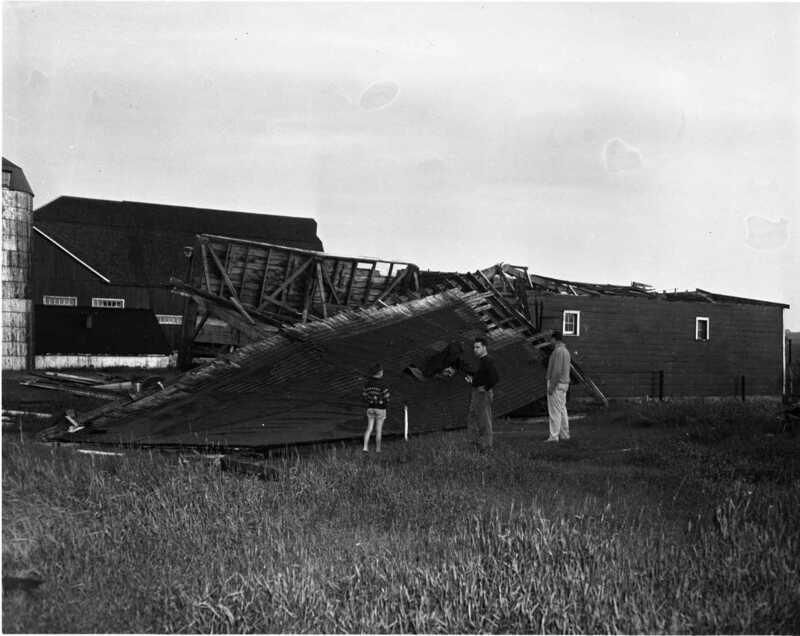 Midland’s town dock became a veritable “Times Square” when 200 sea cadets and all their kit struggled their way down the dock while 400 passengers from the S. S. North American were making their way toward the main street. The cadets were boarding the “City of Dover” and the “Midland City” on the last leg of their journey to the island camps. Interested spectators from Midland and many tourists jammed the docks with bicycles, baby carriages and cars, making the congestion worse. St. James on the Lines, Anglican Church, celebrated the 110th anniversary of its founding. Organist for the occasion, Miss Laura Kemp had held the position of organist for 60 years. Boat trips from Midland to Honey Harbour, Minnicog and return, had a fare of 75 cents. Moonlight excursions were 50 cents and a three-day cruise to Point Au Baril was $121 return fare. For the first time since its purchase in 1921 the Georgian Bay Shipbuilding and Wrecking Company’s floating dry dock was moved from its position at the foot of the company’s yards. The occasion, to make room for the self-unloading coal freighter S. S. J. E. Savage which arrived with 2,000 tons of coal. 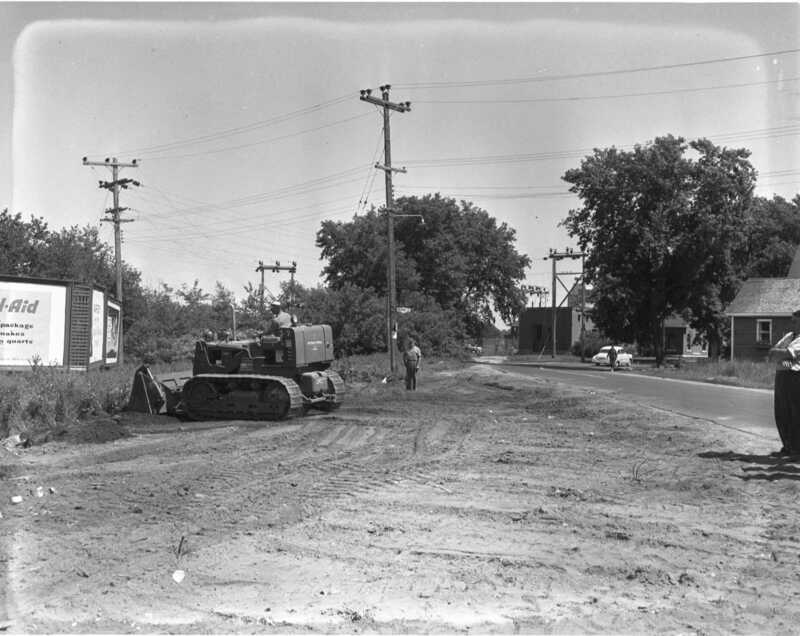 Simcoe County’s two largest towns, Midland and Orillia, were to be joined by a paved highway. The road was authorized as a King’s highway. 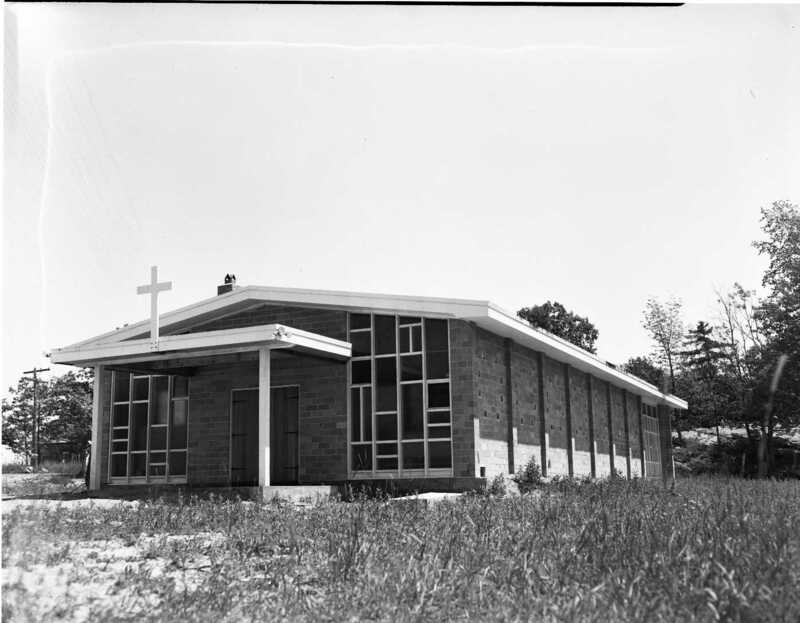 A new Gospel Hall building was opened at Midland and Dominion Avenues, to replace the smaller building on Dominion Ave. near First Street. One of the top movie hits of 1931 , “A Connecticut Yankee” starring Will Rogers, was playing at the Bijou Theatre in Penetang. 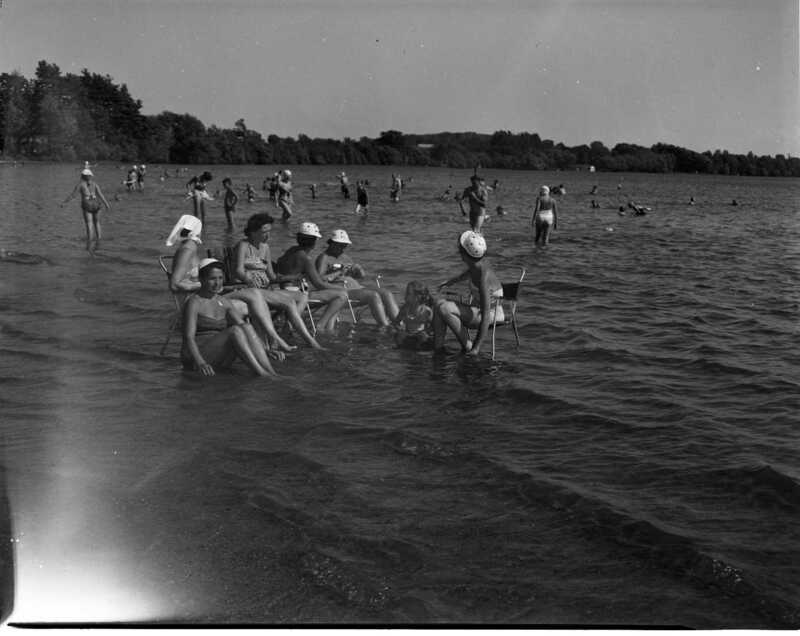 Busiest day in the history of Little Lake Park was recorded when thousands thronged the park to escape the heat wave which had hit the district. Nearly 200 tents dotted the slopes of the camp site. 25 year veteran of the Midland PUC, David Hurrie, 76, died in St. Andrew’s Hospital July 19th. Former Penetang mayor William Douglas Hunter dies in Barrie on July 19th. Mr. Hunter came to Penetang in 1926 and purchased the drug store that is now known as Hartt’s Drug Store. At one time he also owned a Midland drug store now operated by W. W. Struthers. In 1951 he moved to Barrie to operate a drug store in Allandale. Norman Lyon Playfair an outstanding citizen of this community for 55 years died July 18th at his 338 King Street home (now 414, formerly owned by Clint & Bev Truax) at the age of 85. He was associated for many years with Milton Bray in the Midland Planing Mills and was a half-brother to Midland’s James Playfair. He is survived by two sons John and James of Midland and a brother Stuart B. Playfair of Toronto. Mrs. Phil Blake, nee Marguerite Irene Sharlow, died at her home at 161 Yonge Street (now 389) on July 3rd. Born in Port Huron Michigan, August 4, 1893, she married Phillip Blake on September 17th, 1913 in Penetang. She had lived in Midland for 58 years. Mrs. Wilfred Vaillancourt, nee Philomene Juneau, died on July 1st in Penetang General Hospital. She was born in Lafontaine in 1881, coming to Victoria Harbour at age 13 has resided there for 62 years. She married in Midland in 1901 and is survived by four sons and a daughter. John Bruce Winfield in his 64th year, died July 13th of a coronary occlusion en route to Midland hospital. 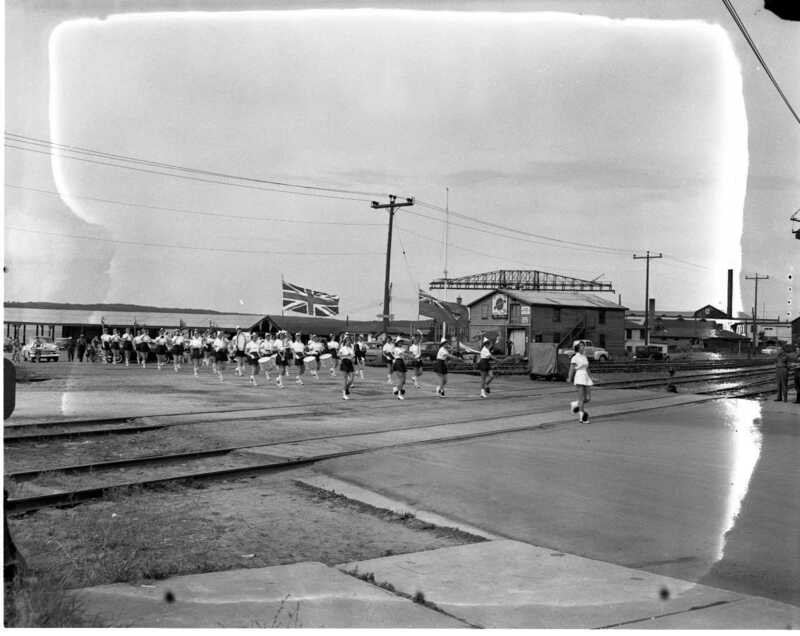 He was born and educated in Victoria Harbour and married Grace Malcolm there in 1916. He was well known as the superintendent of the CPR elevator on Port McNicoll. Anne Louise Sweeting, daughter of Mr. & Mrs. Gerald Sweeting formerly of Midland and Gordon Johnston, son of Mr. & Mrs. Wesley Johnston were married in St. Catherine’s July 7th. Isabel Ellen Woodrow daughter of Mr. & Mrs. James Woodrow, Coulson, and James A. Reynolds, son of Mrs. Thomas Reynolds, Waverly, were married in the Hobart United Church July 7th. Rita Dumais, daughter of Mr. & Mrs. Gilbert Dumais, Penetang, and William Leclair, son of Mr. & Mrs. Willard Leclair of Midland were married at St. Ann’s RC Church. Beatrice Bechard, daughter of Mr. & Mrs. Andre Bechard, Penetang and John Dusome, son of Mr. & Mrs. Levi Dusome , Penetang, were married in St. Ann’s on July 2nd. Cecile Beausoliel, daughter of Mr. & Mrs. Andre Beausoleil, Penetang and Richard Desroches, son of Mr. & Mrs. Constant Desroches, Lafontaine, were married in St. Ann’s. Anita Teresa Robitaille daughter of Mr. & Mrs. Clement Robitaille, RR 2 Midland and Arthur Joseph Beausoliel, son of Mr. & Mrs. Prosper Beausoliel, Penetang, were married at St. Patrick’s Church, July 2nd. 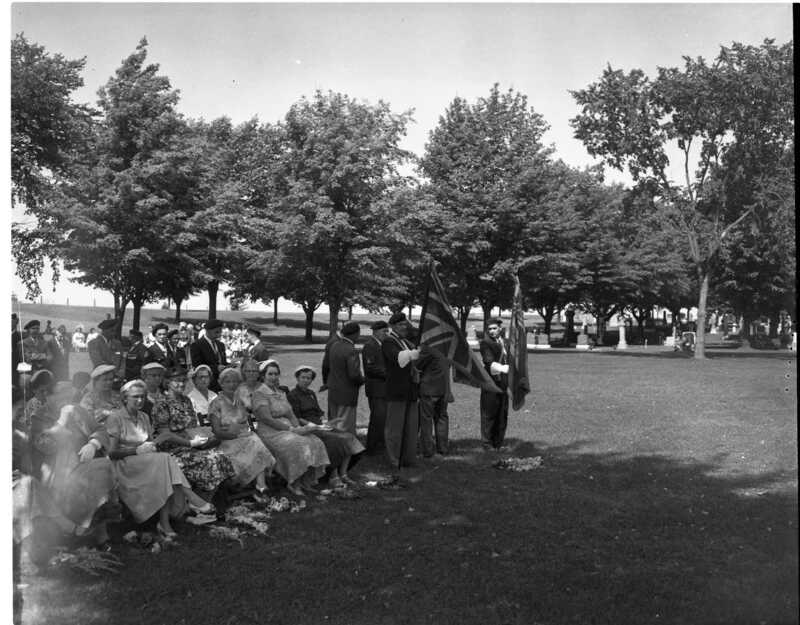 Eleanor Marchildon, daughter of Etienne Marchildon and Stan Therrien, son of Mr. & Mrs. Leonard Therrien, Penetang, were married at St. Patrick’s Church. Bernice Lacroix, daughter of Mr. & Mrs. Treffle Lacroix, Penetang, and Henry Hamelin Jr., son of Mr. & Mrs. Henry Hamelin, Penetang, were married at St. Ann’s Church, July 2nd. hey-great pix this week. well done and thanks. enjoyed the wonderful lodge pictures. very active back then!